This is part two of a three part guide, click here to start at part 1. 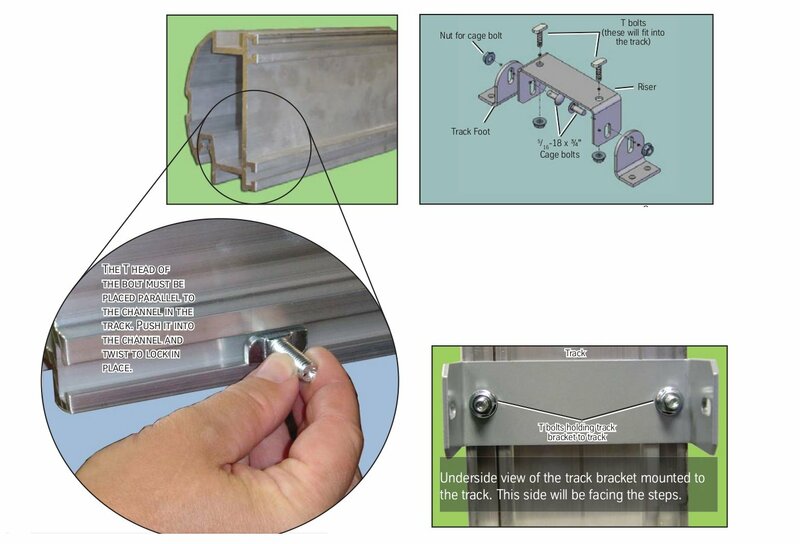 After the track is connected and the wire run, you can begin attaching the mounting brackets to the track. These brackets will support the entire weight of the stair lift and its occupant. The standard bolts are intended for a wooden staircase, so if you have a cement or brick staircase, you will need a special type of bolt available from the dealer. The brackets are made up of three pieces and use what are called T-Bolts. When attaching the brackets, you will want to leave them a little loose, so that you can reposition them as you place the track on the stairs. There should be one bracket on the botto m step, one located on the top step, and each 8 foot section of track should have three brackets.. There should also be a bracket before and after each section of track. 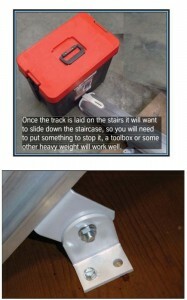 Once the mounting brackets are attached, it is time to attach the track to the stairs. Place a heavy piece of wood or a tool chest at the bottom of the stairs, the track can be propped up against this as you install the mounting brackets. Start by placing the track in the middle of the stairs. This will give you enough room to adjust the mounting brackets. Once the mounting brackets are in place, move the track as close to the wall as the mounting brackets will allow and bolt the mounting brackets to the stairs. Plastic caps come with the brackets that can be placed over them. I have a Bruno stairchair and would like to take it down in order to put new carpet on my stairs and then have it reinstalled. Does anyone do this? There are 15 steps and it is a straight stairway. Can you provide someone who might do this and an estimate of the approximate cost to remove and replac my chair. Sandra, you should be able to find someone in your area to help remove and reinstall your stair lift! I would start by contacting your local medical supply company and asking them if they know anyone in the area that specializes in it. You may also have luck contacting a Bruno distributor, preferably close by, as most sub-contract installers and may be able to provide a referral for you. If not, a regular handyman should be able to remove it, just go online and find the installation manual and have it available when they are there! Usually, with do it yourself stair chairs, like Ameriglide or Bruno stair lifts, the installation process is fairly straightforward.